Situated in Arlington, this hotel is within 1 mi (2 km) of The Parks at Arlington and Arlington Highlands. MetroCenter is 2.7 mi (4.3 km) away. Situated in the entertainment district, this motel is within 2 mi (3 km) of Cityplace Center, Granada Theater, and Gerald J. Ford Stadium. Southern Methodist University (SMU) and Perot Museum of Nature and Science are also within 3 mi (5 km). CityPlace - Uptown Station is 22 minutes by foot. Situated near the airport, this hotel is within 2 mi (3 km) of Louis Tussaud's Palace of Wax, Verizon Theatre at Grand Prairie, and Lone Star Park. Grand Prairie Shopping District and Uptown Theater are also within 3 mi (5 km). 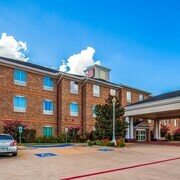 Situated near the airport, this hotel is 1.2 mi (2 km) from Methodist Charlton Medical Center and within 6 mi (10 km) of Cedar Hill Shopping District and Hillside Village. Dallas Zoo and Bishop Arts District are also within 12 mi (20 km). 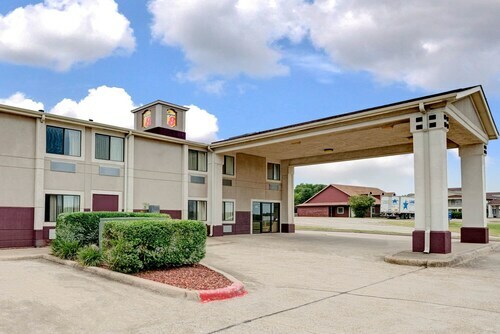 Located in the heart of Waxahachie, this hotel is 12.6 mi (20.3 km) from Texas Motorplex and within 25 mi (40 km) of Dallas Zoo and Bishop Arts District. Hawaiian Falls Mansfield and Methodist Charlton Medical Center are also within 25 mi (40 km). Located in the heart of Fort Worth, this hotel is within 6 mi (10 km) of Maverick Stadium, Globe Life Park in Arlington, and AT&T Stadium. University of Texas at Arlington and Arlington Convention Center are also within 6 mi (10 km). Situated in Mesquite, this hotel is 2.4 mi (3.8 km) from Mesquite Shopping District and 2.7 mi (4.4 km) from Town East Mall. Lake Ray Hubbard and Mesquite ProRodeo are also within 6 mi (10 km). Situated in a rural location, this hotel is 11.2 mi (18 km) from Plaza Theater and 12 mi (19.4 km) from Lost Oak Winery. Cleburne Golf Links and Hawaiian Falls Mansfield are also within 20 mi (32 km). 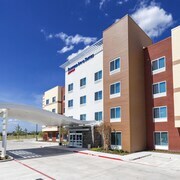 Situated in Terrell, this hotel is 1.1 mi (1.8 km) from Tanger Outlets and 2.5 mi (4 km) from Southwestern Christian College. Lake Ray Hubbard and Mesquite Shopping District are also within 25 mi (40 km). You deserve a travel experience that exceeds your expectations and La Quinta Inn & Suites hotels in Waxahachie can make sure that happens. While you’re vacationing, or even traveling for business, it’s all about you. You shouldn’t have any worries or concerns when you’re on the road, which is why you always choose to stay in accommodations you know and trust. If you’re ready for excellent customer service at a hotel with a solid reputation, then you know where to go. These hotels will always treat you well, from the thread count of your sheets to the stocked minibar for all your snacking needs. When you’re ready to explore, head out to discover the local sights and get recommendations from the hotel staff on the best restaurants, too. 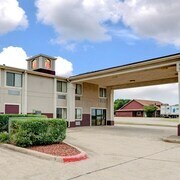 Waxahachie La Quinta Inn & Suites hotels are the perfect place for your getaway. Many are conveniently located near parks, shopping, restaurants, nightlife, and downtown, giving you the luxury of convenience at an affordable price. If you think this might tip the budget scale to heavy, don’t worry--Travelocity offers cheap La Quinta Inn & Suites hotels in Waxahachie. You get more than comfortable accommodations for a very reasonable price. Book your stay through us now and receive special online promotions, discounts, and offers for future travel plans. The request for toilet tissue only to be told that there was no housekeeping on duty and one person at the desk on a Saturday night was shocking. Never received the toilet tissue until the next morning after another request: other than that a pleasant stay. This will be my hotel of choice when I come back to Arlington. The property was very neat and inviting! We were pleased with our overnight stay. Would recommend to others. The breakfast room and food choices were very pleasant.